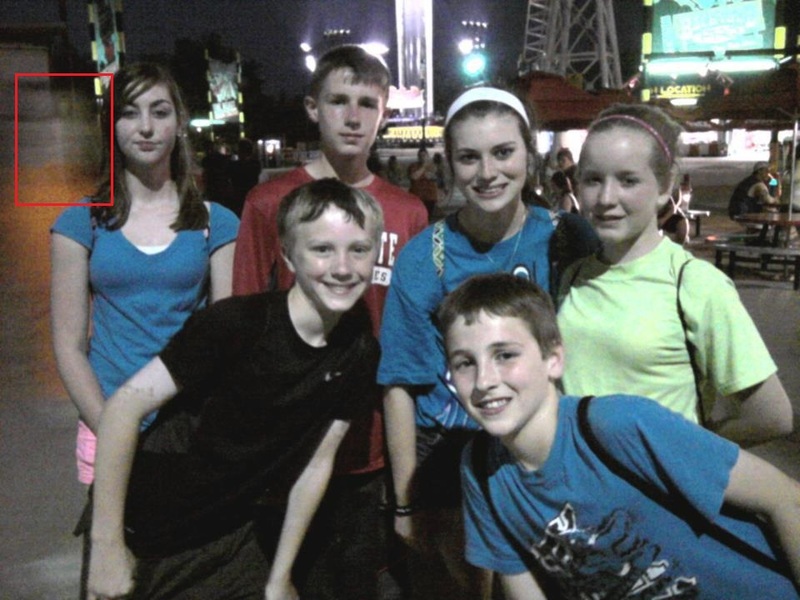 Reader Submission: Ghostly Photo Bomb at Kings Island? We haven’t (yet) covered Kings Island on the site, but I’ll share this latest email anyway. This picture comes to us from Erin, and here’s what she had to say. A few years ago my sister and her friends went to King’s Island. They had someone take their picture that night. When she got home she was showing me all of her fun times. As I looked at this picture, I noticed something in the background and zoomed in to find what appears to me to be a ghost. I then did some research on any deaths at King’s Island and found that in the early 1920’s two train cars loaded with gunpowder belonging to King Powder Company, that was originally located where present-day King’s Island is, collided and caused an explosion that killed 11 people, one of them being a little girl in a dress that is said to still haunt King’s Island today. ← Reader Submission: Haunted Train Ride at the Cincinnati Zoo? Btw it’s not called the King Powder Company, it’s the Peter Cartridge Factory located on Kings Mill. The trains collided on July 15, 1890. There were no reports that any childeren died. There where reports of 11 deaths. One of those 11 people that were killed was my Great-Great Grandfather. The trains didn’t collide where Kings Island is now. Reports say it collided on the other side if Kings Mills a few miles away from the factory. Believed it was caused from Brake Failure. Ha this is hilarious cause I’m the kid up front with the blue shirt on. It was simply a person walking behind us cause I remember. That was our school band trip a couple years ago. I knew all those kids and non of them had a sister. They just got this from Facebook when one of us posted the picture. There were three deaths on one Sunday back in the early 90’s. Two guys jumped into the pond by the Beer Gardens to help a guy who had fallen in and was being electrocuted, but were killed theirselves. A hour or so later, a lady fell to her death from the Flight Comander. One of my Dad’s Co-workers was within a few feet of where she landed. It happened to be the same day as his company picnic, which also happened to be Gay Day.